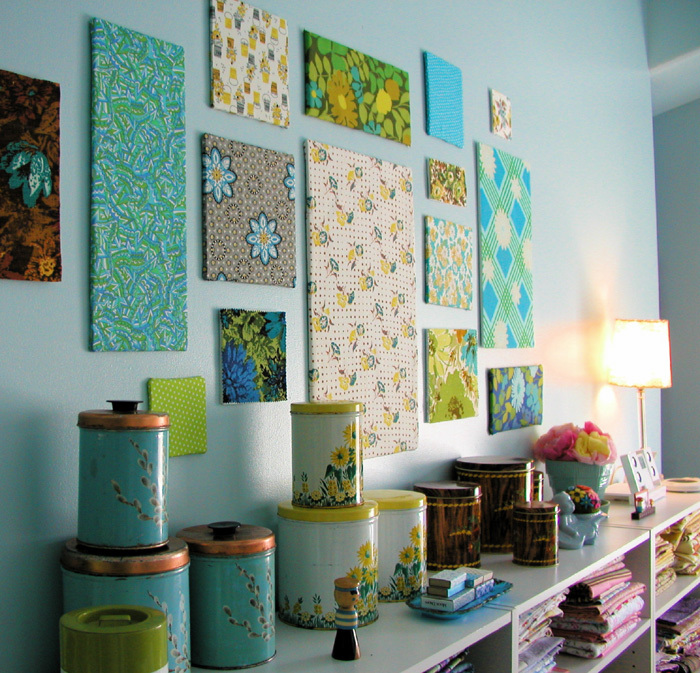 Ever wonder what to do with your fabric scraps? Here’s a list of DIY fabric crafts you can do to make them into something beautiful for your home or as gifts. Handmade gifts are always special! Since I have a bin fabric scraps in all colors and sizes, it’s just about time to put them to good use. This list of DIY fabric crafts involves cute, easy, creative and fun ideas to do with fabric scraps! I have so much leftover fabric from the last DIY clothing project I made and I just can’t decide what to do with it. Well, honestly, I have so much scrap fabric than I want to admit. I am pretty determined to do DIY gifts this year. I know it’s already November and you might think of doing DIY gifts requires time, but hey…these 22 DIY fabric crafts are pretty easy to make and I believe you’ll love to try them. Have fun browsing my list! A quick and easy DIY home decor sure to spruce up a boring wall! Be ready, your recipient may ask for more once they see how this fabric wall art adds color to their walls. You don’t need a lot of fabric to make your next pet project. This DIY fabric dog collar is the purrfect way to give your pet some major style on a small budget. This DIY fabric necklace is on my priority list, it’s such a simple yet pretty craft! A perfect little handmade gift for your fashionista friend to add a touch of glam to her casual attire. Ready for your next DIY decor? Grab some Styrofoam balls and scrap fabric for this craft project. The finished craft may look complicated, but don’t fret because the DIY fabric wrapped globes is very easy to make. This Boho bracelets DIY is a great addition to your DIY bracelet collection or a perfect gift to complete a friend’s fall wardrobe. There’s just something about a pink and green color combination that I can’t seem to get enough of! This fabric woven basket is a must-try for me to add interest to my boring wire basket. I’m only debating what to use it for once I’m done with it: a storage for kid’s toys, a laundry basket, or a surprise for mom? Hmmm? Create cool patterns with this DIY fabric marbling technique. Just imagine how many DIY projects you can make using this style and how many friends you’ll make happy once you give them with a wonderful marbled fabric craft. Make a keepsake book even more special and one-of-a-kind and cover it with your favorite fabric. The book you’ll give will be more appreciated if you cover it with a fabric best suits the person receiving the gift. For your next sewing project, you’ll have a safe place to store your phone while charging. Make one DIY fabric charging station for every member of your family. I’m sure they’ll appreciate the gesture. Make some lovely DIY fabric flowers. I’m sure you’ll find it useful for some easy DIY craft projects. Can you think of some now? Planning on giving live plants this year? These covered flower pots surely add some sassy style to your gift. A simple project to make your gift more fantastic. Don’t you just love it when all you need is a glue gun? I’m pretty sure your tween will love this no-sew bow. It’s a simple craft you can do together. Who ever said coasters have to match? They just have to follow a theme showing how much you truly know your recipient. These DIY vintage scrappy patchwork fabric coasters make a lovely surprise for a friend who likes a vintage style. Upcycle your old t-shirt and turn it into a colorful no-sew market tote bag you can bring to the market. It’s wonderful carry-all bag you can bring anywhere. Makes a beautiful gift to your market buddy! Getting bored with your plain old sneakers? Give it some new personality with this easy DIY fabric accent sneakers tutorial. In need of a new headband? Well, this DIY Headband tutorial is your chance to make one for yourself–plus some extras, because they make great gifts. Got a friend who’s expecting a baby? She will surely love this diaper and wipes case she can carry around. It has a very easy tutorial and I’m pretty sure this gift will be highly appreciated. You don’t need to be an expert to make this super easy fabric scrap mousepad. Make a few so every techie in the family gets their own! These fabric covered switchplates will transform a plain switchplate to an eye-catching piece of decor. It’s sure to raise some eyebrows–in a good way! So, raise brows and have the envy eyes of your recipient. How about a craft that helps with your little one’s developmental skills? The young and young at heart will have lots of fun with this fabric scrap memory game. You’ve got some fabric covered books, so complete the with fabric scrap bookmarks. Nothing beats a complete gift! If like me, you love to make everything stylish on a budget, then you’ll love this custom camera strap cover. Don’t forget to make one for each season or as your heart desires. If you’re fond of sewing, I’m pretty sure you have plenty of fabric scraps. And now, no more worries of what to do with fabric scraps because your crafty side will certainly do its magic with the help of this list, of course!